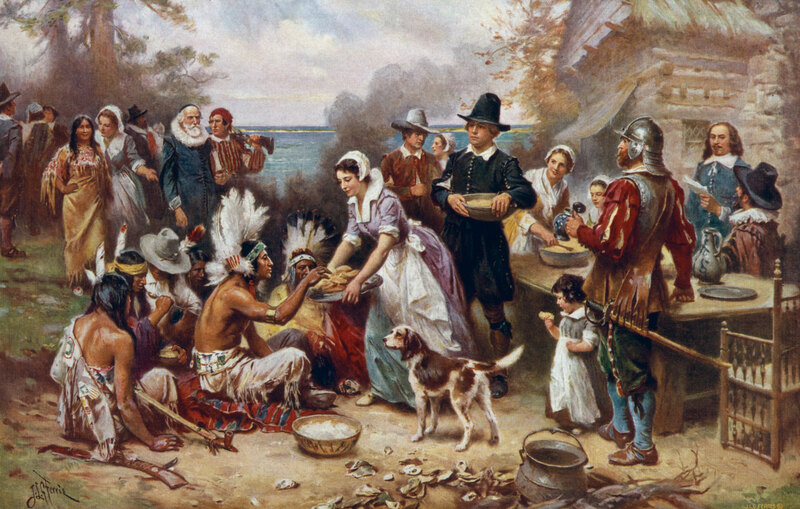 I’m not sure of the accuracy of this depiction of the first Thanksgiving, but it is the inspiration for this Not-So-Wordless Wednesday post. While there may be a lot happening in the image, I’m not sure if it fully captures all that occurred during that first Thanksgiving. Many of those lessons seem to have been lost over the centuries, crowded out by thoughts of food shopping and preparation, football, and Black Friday, which, in my opinion, is one of most vile displays of human behavior — so much so that my Mayflower ancestor, William Brewster, would cringe. Apparently, we could all use a bit of that first Thanksgiving. We were all raised with the idea that this all-American holiday is a chance to reflect on our lives and to acknowledge and appreciate all that we are thankful for. Personally, my list includes the annual favorites: a great relationship with Joe, a supportive family, my health. I’m even thankful that I began blogging and that so many people have not only found my site, but have responded so favorably, offering advice and laughs and inspiration in each of their comments. But as I look at the endless feed of downward spiraling economic news and the footage of the global Occupy movement, I have added my home and my job to the thankful list. There are so many, many people out there, of all races and religions and genders and ages and abilities and sexual orientations, who may not have much to be thankful for. Perhaps things have gotten so bad that they can only say that they are thankful for their coat. Then, to make matters worse, we Americans are in the early stages of our bizzarre campaign season. I do believe the rest of the world scratches its head in wonder as the candidates begin their divisive rhetoric. And in the end, they have managed to get a sound bite on the evening news while having said a whole bunch of nothing. Then I look at the picture above and the story of the Pilgrims. Things were tough then, much worse than they are today — and yet the Pilgrims were able to survive hunger, disease, and cold — thanks to the help of strangers, the native people of this New World. Before the feast could be prepared, there had to be lessons learned. There were lessons about cultivation and harvesting and stewardship — but these lessons occurred only because Pilgrims and Native Americans put aside their fear and mistrust of people who were different, thereby allowing them the chance to accept knowledge and to achieve understanding. Imagine those early interactions. Hesitancy and neccesity. Fearfulness and curiousity. Two very different peoples — culturally and ethnically — growing into the realization that they needed each other in order to survive. So this Thursday, somewhere between giving thanks and please pass the turnips, let’s all remember that first Thanksgiving and the very basic lesson learned there. Maybe then, as a nation, as a world, we can come to understand that we need one another to survive, that all of us have value, that all of us can bring something to the table — even if it’s a sliced log of cranberry gel — so that future Thanksgivings will truly be full of thanks. Thank you for sharing this lovely post. Happy Thanksgiving! You’re very welcome. I hope you and your family enjoy the holiday. Cheers! Mario, hope you have a wonderful Thanksgiving! Well put, as usual! Happy Thanksgiving to you and Joe! Thanks. Hope you have a wonderful holiday with your family. An enjoyable post, have a great thanksgiving! Thanks for stopping by and for your kind words. Cheers! If you got a sound bite on TV, I would vote for you!